Water damage is something that must be taken seriously immediately. If your home has suffered from water damage, give KIWI a call right away to begin water damage repairs. KIWI offers 24/7 water damage restoration and we have done so for over 30 years. Our water damage services are the #1 choice in Atascocita and we will help bring your home back to order. KIWI’s water damage repair team is the reason for our satisfied customers over the years. 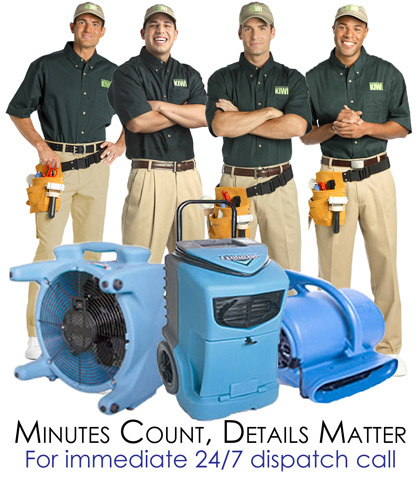 Our team uses state of the art water damage restoration equipment that can fix all water damage issues. We will work quickly and effectively to put your home back in order, and we can store any savable items in our off-site storage unit for free. KIWI offers a lot of different water damage restoration services. From extracting standing water to carpet repair, KIWI has you covered. KIWI also offers our one-year carpet cleaning warranty for all carpet work done. KIWI wants to put you and your needs first which is why we will work with your insurance to help cover costs. KIWI also offers a one-year water damage restoration guarantee. If you should run into any problems with your water damage restoration experience, give us a call and we will be back out right away to offer a complimentary re-do.